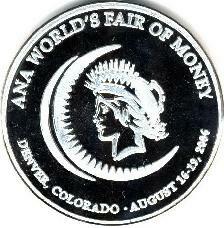 As the official host club for the American Numismatic Association's World's Fair of Money, held August 16-19, 2006, at the Colorado Convention Center in Denver, the Denver Coin Club has produced a commemorative medal. 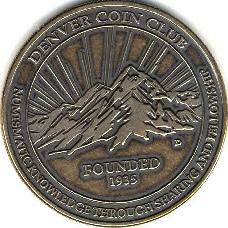 Actual scans of the obverse and reverse are pictured on this page. Limited quantities are still available, and mail orders are now being accepted. 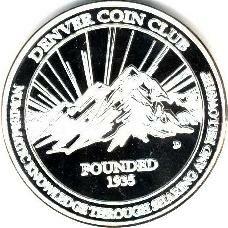 Only the Antique Brass medal is now available. 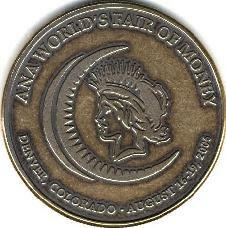 These remaining medals have been slabbed by ANACS. 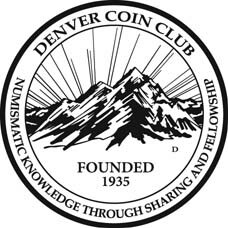 Make your check or money order in U.S. dollars payable to "Denver Coin Club." Order quantities are limited to the remaining inventory. Prices include sales tax, shipping and handling.